Shyness isn’t always a problem. Really! Humans come in all different temperaments, and thank goodness for that. American popular culture tends to favor social, outgoing people, but (a) other cultures send different messages, and (b) neither way is “right or wrong”. Rather, it is FAR more important that your child feel comfortable the “just way they are,” to quote Mr. Rogers. First of all, consider your child’s developmental stage. Young toddlers go through stages of separation anxiety, but so do older kids, it just looks different. The most prominent period for this (later) is when children start kindergarten. This is a huge transition for kids, and results in shyness, or regression, or a host of other behavioral changes. It’s normal. In those situations parents need to continue to support and love their child, talking about the changes and your child’s feelings and how to cope. Things will get better with time. A second period of developmental shyness is normal around the early stages of puberty, too. Body changes are accompanied by greater pressures from peers, and emotional and hormonal shifts. It’s a tough time, and shyness is often part of the picture. Again, just keep supporting, loving, talking, and teaching and things will get better with time. An extrovert is someone who ‘gets their energy’ from interacting with others. An introvert is someone who gets their energy from within, from being alone. Which one is your child? A shy child might be a perfectly happy and content introvert, with no need for fixing or changing. Is your child happy? Do they think their shyness is a problem? I encourage you to ask them! In a non-confrontational way–perhaps when it’s just the two of you in the car going somewhere–bring up the topic of shyness. For example: “John, did you have a good time yesterday at Dan’s birthday party? If your son says “No,” talk a little about why he didn’t have a good time. Perhaps he himself felt that his feelings of shyness kept him from enjoying himself. If you son says “yes,” you might say “You know, I noticed when I picked you up that you were playing by yourself in the back room.” Perhaps this will spark a conversation. But simply, your goal is to find out whether your child themselves thinks that shyness is a problem. This is part 1 of a 3 part series on shyness. Part 2 is here, and part 3 is here. 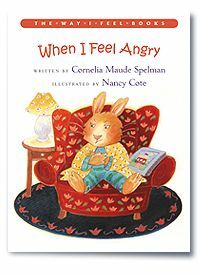 “When I Feel Angry” is a children’s book by a therapist, Cornelia Maude Spelman. She’s also the author of “When I Feel Sad,” reviewed earlier here. When I Feel Angry is also aimed at the younger crowd, from apx 2-9 or so years of age, depending on your child’s reading and interest level. So, consider this another ‘highly recommended” book to keep in your child’s library. If you’d like to buy this book, you can click on the picture of it below–it’s a link to the book’s page on Amazon.